Pro: "As governor of Utah I supported and signed every prolife bill that came to my desk… I signed the bill requiring parental permission for an abortion." None Found: Withdrew on Jan. 16, 2012; no additional research done as of that date to determine candidate’s position on this question. Not Clearly Pro or Con: "To protect taxpayers from future bailouts and stabilize America's economic foundation, Jon Huntsman will end too-big-to-fail. Today we can already begin to see the outlines of the next financial crisis and bailouts. More than three years after the crisis and the accompanying bailouts, the six largest U.S. financial institutions are significantly bigger than they were before the crisis, having been encouraged by regulators to snap up Bear Stearns and other competitors at bargain prices. These banks now have assets worth over 66 percent of gross domestic product – at least $9.4 trillion – up from 20 percent of GDP in the 1990s. There is no evidence that institutions of this size add sufficient value to offset the systemic risks they pose." Con: "As president, Jon Huntsman will dismantle Fannie Mae and Freddie Mac. Eliminating the GSEs should not be controversial. At its heart, the Panic of 2008 was a crisis born of crony capitalism. It is unconscionable that five years after the start of the housing crisis, these companies have not seen a serious reform proposal and most of their executives are still in power. Today Fannie and Freddie purchase more than 90 percent of new mortgage originations. This is not evidence of the lack of a private market for loans, but is an illustration of a private sector forced to cede the field due to an inability to compete with state subsidies. The firms cannot be unwound overnight nor can they simply be privatized. Pure privatization would result in new systemically risky too-big-to-fail private sector institutions. Governor Huntsman’s administration will oversee the creation of a new Resolution Trust Corporation along the lines of what was used to resolve the savings and loan crisis of the 1980s. This reconstituted RTC will sell off Fannie’s and Freddie’s assets. Its predecessor was able to close almost 800 thrifts in six years; the unwinding of Fannie Mae and Freddie Mac should be accomplished in a somewhat longer but similar time frame." Not Clearly Pro or Con: "Right-to-work legislation [laws that let employees decide for themselves whether or not they want to join a union or financially support it] shouldn’t generate controversy. The law would protect a worker’s basic right to freedom of association by preventing individuals from being forced to give part of their paycheck to a union for the privilege of going to work. In this country, no one should be forced to join or finance a private political organization against his or her will…I witnessed firsthand the fruits of that advantage in Utah, which is one of 22 states with a right-to-work law. Our state was first in the nation for job growth, largely because of policies — like right to work — that create an environment for small businesses and entrepreneurs to thrive." Not Clearly Pro or Con: "We must compete our way to prosperity. When I was born, manufacturing comprised 25% of our GDP, today it is down to around 10%, this does not reflect a decline in American ingenuity, or work ethic, it reflects our government’s failure to adapt to the realities of the 21st century economy. We need American entrepreneurs not only thinking of products like the iphone or Segway, we need American workers building those products. It is time for made in America to mean something again." Con: "No Child Left Behind hasn‘t worked for this country. It ought to be done away with. We need to take education to the local level, where parents and local elected officials can determine the destiny of these schools. Nobody wants their schools to succeed more than local elected officials and their parents." Pro: "The minute that the Republican Party becomes the party -- the anti-science party, we have a huge problem. We lose a whole lot of people that would otherwise allow us to win the election in 2012. When we take a position that isn't willing to embrace evolution, when we take a position that basically runs counter to what 98 of 100 climate scientists have said, what the National Academy of Sciences has said about what is causing climate change and man's contribution to it, I think we find ourselves on the wrong side of science and, therefore, in a losing position." Not Clearly Pro or Con: "Hugh, I clearly misunderstood your question regarding the assault weapons ban. I would absolutely veto the ban. I have always stood firmly for 2nd Amendment rights, and my record in Utah reflects it. With a name like 'Huntsman' it really goes without saying." Con: "The individual mandate included in ObamaCare is an unconstitutional assault on the individual liberty of the American people, and I support today's ruling by the Appeals Court of the 11th Circuit. When I was Governor of Utah, I signed free-market healthcare reforms designed to help small businesses and individuals, rather than burden them with mandates, fines and massive bureaucracies. As President, I will repeal ObamaCare and put an end to the economic uncertainty that it has created." "[R]equires public employers to register with and use a Status Verification System [e-verify] to verify the federal authorization status of a new employee." Pro: "When elected president, I‘m simply going to prove to the American people that we can secure the border. That‘s what they want done. And I‘m not going to talk about anything else until we get it done. Secure the border. Eighteen hundred miles, we‘ve got a third of it done, between fencing and technology and National Guard boots on the ground. We can finish." Not Clearly Pro or Con: "I don't believe in penalizing the younger generation coming across our borders who have no say whatsoever over their journey and destiny. They want to integrate into the American system. If they're willing what needs to do be done and work hard, then I think if we're giving them an in-house tuition break, that integrates them into the system, and makes them part of ultimately contributing to our country." Not Clearly Pro or Con: "I think we have achieved some very important objectives for this country and it's time to bring people home. It is time to focus on our core in this country. And we cannot do it with our eye taken off the ball. Of course we're going to have security challenges with these subsidiaries that have formed all over the world. It is a counter terror effort. We have to rise to the occasion. We have to be prepared to wage that kind of war. It is a much different approach. It isn't heavy boots on the ground but it is more Special Forces and tactical intelligence gathering. That's what our future is going to be like and we have to be prepared for that reality." Not Clearly Pro or Con: "Listen, I don’t want to re-litigate the Iraq War…I visited [Iraq] three times as governor, and I’m very, very proud of all our troops in the National Guard. I was their commander in chief. And to this day, all I can say is that I’m grateful for the role that they played and the sacrifices they made, including families who lost and made the ultimate sacrifice. I’ll say no more." Not Clearly Pro or Con: "I believe in civil unions. I think we can do a better job in this country as it relates to equality and basic reciprocal beneficiary rights. I'm in favor of traditional marriage, I don't think you can redefine it without getting in trouble, but I think along with that we can have civil unions. I think this country has arrived at a point in time where we can show a little more equality and respect. Leave it to the states, I think it is a state issue that ought to be driven by discussions in various states, and you've got the Defense of Marriage Act that basically is a safeguard that allows that to happen." Not Clearly Pro or Con: "Let me just say that I want to be the president of the 99 percent. I also want to be the president of the 1 percent. This nation is divided, and it's painful, and it is unnatural for the most optimistic, blue-sky people this world has ever known. We are problem-solvers. Thank you. I do agree that we have blown through trillions and trillions of dollars with nothing to show on the balance sheet but debt, and no uplift in our ability to compete, and no addressing our level of unemployment. And I do agree that we have institutions, banks that are too big to fail in this country. And until we address that problem - we can fix taxes. We can fix the regulatory environment. We can move toward energy independence. So long as we have investment banks that are too big to fail, we are setting ourselves up for long-term disaster and failure." Not Clearly Pro or Con: "Huntsman: In social security, we're going to have to take some bold measures as well. We're going to have to back out the retirement age. Why? Because we have no choice. We're going to have to move it something closer to the 85th percentile of the average length of life. We're living a whole lot longer than we were in 1935 when Social Security came about. So a combination of moving the retirement age and maybe indexing the underlying numbers to C.P.I. as opposed to the assumptions that today are being used. Those two things alone I think would make a significant impact on social security. Interviewer: So should there be a means test in terms of your income and whether or not you should receive social security? Huntsman: Absolutely. Absolutely there should be. We've got a lot of people in this country who don't need social security, who don't need Medicare and I think we need to look realistically at where we ought to be drawing those lines, means testing absolutely should be on the table." Pro: "Reduce The Corporate Rate from 35% to 25%. The United States cannot compete while burdened with the second-highest corporate tax rate in the developed world; American companies and our workers deserve a level playing field. With high unemployment, it is important that we not push corporations and capitals overseas. We need employers to be based in America if they’re going to provide jobs to Americans." [In addition, Jon Huntsman wants to eliminate] taxes on capital gains and dividends." Pro: "Greta Van Susteren: Would you like to see a balanced budget amendment on the federal level or is that an unwise decision If so, why? Huntsman: I think it's the most important thing we could do. I think having that safeguard, having that standard at the federal level is a very, very important thing for this country. When you build a budget as governor, you do so with the idea in mind that you are presenting it to your legislature in balanced form and I think for this nation that would be a similarly wise thing to do." Con: "We diminish our standing in the world and the values that we project, which include liberty, democracy, human rights and open markets, when we torture. We should not torture. Waterboarding is torture. We dilute ourselves down like a whole lot of other countries, and we lose that ability to project values that a lot of people in corners of this world are still relying on the United States to stand up for." 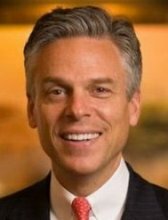 Full Name: Jon Meade Huntsman, Jr.